Note that we call ZeroMemory() on the struct in order to initialise it to 0. This is generally a wise practice, as some APIs are very picky about members that you don't use being set to NULL. This way you don't need to explicitely set each member that you don't use. You can easily find out the meanings of the various members by looking them up in your documentation. The lpstrFilter value points to a double-NULL terminated string, and you can see from the example that there are several "\0" throughout it, including one at the end... the compiler will add the second one at the end as it always does with string constants (that's what you generally don't need to put them in yourself). The NULLs in this string break it up into filters, each one is two parts. The first filter has the description "Text Files (*.txt)", the wildcard isn't required here I just put it in because I felt like it. The next part is the actual wildcard for the first filter, "*.txt". We do the same thing with the second filter except that this is a generic filter for all files. You can add as many different filters as you'd like. 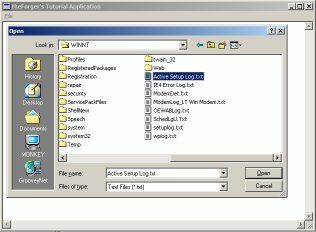 Windows NT 4.0: In an application that is compiled with WINVER and _WIN32_WINNT >= 0x0500, use OPENFILENAME_SIZE_VERSION_400 for this member. Windows 2000/XP: Use sizeof (OPENFILENAME) for this parameter. Basically what this means is that as of Windows 2000 they added some members to this struct, and so it's size changed. If the code above doesn't work for you it's possibly because the size that your compiler used and the size that your operating system (ie. Windows 98, Windows NT4) expected were different and so the call failed. If this happens, try using OPENFILENAME_SIZE_VERSION_400 instead of sizeof(ofn). Thanks to people that pointed this out to me. In windows you have a few options as to how you want to access files. You can use the old io.h open()/read()/write(), you can use stdio.h fopen()/fread()/fwrite(), and if you are in C++ use can use iostreams. However in windows all of these method ultimately call the Win32 API functions, which are what I will use here. If you are already comfortable using file IO with another method it should be fairly easy to pick up, or if you want simply use your method of choice to access files. bSuccess = TRUE; // It worked! There is a complete function to read a text file into an edit control. It takes as paramters the handle to the edit control and the name of the file to read in. This perticular function has a fair bit of error checking, file IO is one place where a lot of things can go wrong, and so you need to be on the lookout for errors. Note the variable dwRead. We don't use it except as a paramter in ReadFile(). This parameter MUST be provided, the call will fail without it. In the call to CreateFile() GENERIC_READ means we only want read access. FILE_SHARE_READ means it's okay if other programs open the file at the same time we do, but ONLY if they want to read as well, we don't want them writing to the file while we are reading it. And OPEN_EXISTING means only open the file if it already exists, don't create it, and don't overwrite it. Once we've opened the file and chacked to see that CreateFile() succeeded, we check the size of the file so we'll know how much memory we need to allocate in order to read the entire thing. We then allocate the memory, check to make sure the allocation succeeded, and then call ReadFile() to load the contents from disk into our memory buffer. The API file functions have no concept of Text Files so they won't do things like read a single line of text, or add NULL terminators to the end of our strings. This is why we've allocated an extra byte and after we read in the file we add the NULL ourselves so that we can then pass the memory buffer as a string to SetWindowText(). // No need to bother if there's no text.